Scarlett is feeling great! She seems to be recovered from last week's final chemo dose, and is picking up her energy level every day. She started school again on Monday. She had a great time, and loves her class, teacher and aides. 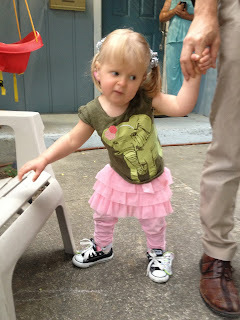 There are 4 other kids in her class, all with hearing loss of some kind. She loves to climb around the classroom, sing and dance and eat her snack. She's been so tired this week - lots of nice, long nights of sleep! 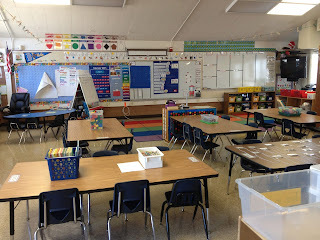 My classroom, ready for the first day of kindergarten! It my my first week back at work, too. 25 Kindergarteners and me...it's an adventure, for sure. The next few weeks will be very tiring! On Friday, we had the second meeting in the process of developing Scarlett's Individual Education Plan (IEP). The IEP is the document that lays out her education needs with the school district; once her third birthday arrives in October, her services transfer from the county's Regional Center to the school district. The last meeting we had in the Spring was a get-to-know-you. We presented all the services she isi currently getting, her needs at the time, and all the reports and evaluations that had been done so far. Several of the people on the IEP team know a lot about Scarlett because I work with them in other capacities in our very small school district. Now that October is coming closer, they will go through a process to evaluate Scarlett before we decide what program will best meet her needs. She will be evaluated for speech and language, fine and gross motor development, emotional and psychological development. To do this, she will have to miss two weeks of her school to attend the district's preschool, where they will observe and evaluate her. Before that, the staff from the district preschool will trek to Berkeley to observe her in her current school. We have several concerns about this process, but we are trying to go with it as best we can. I am worried about Scarlett being in a class of 10 kids (even with 5 adults), and about her losing ground with signing since the district class has people "who know some signs" (their words) versus her current full-time signing school-wide. Right now, I don't see how the district class will be able to meet her needs, but I am giving them a chance to get to know her and tell us what they think they can do. In the end, I am really hoping to avoid a fight. I doubt we will come to an easy compromise, but we will do our best to listen carefully and consider our options. In late September, we will get all the reports from the district and compare them to what we have from all the specialists we have seen over the last two and a half years. Then we have another meeting, or as many as it will take, to come to an agreement on what the district will provide. It may be their school, it may be her current school, but it will have to be whatever Chris and I agree is in her best interest. Now that it is September, please share the gold. 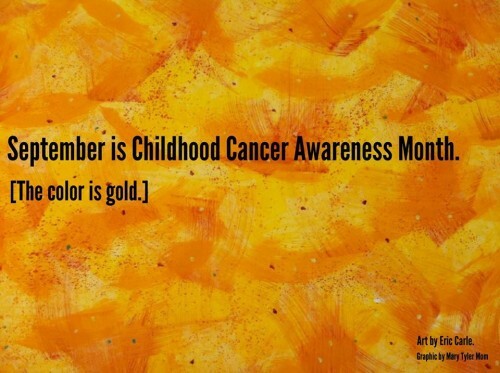 Childhood cancer awareness is critical to funding for research. 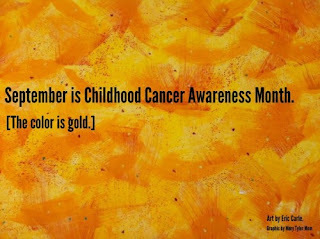 I have posts ready for several days that have facts and links to organizations that are doing fantastic things for children with cancer. Please SHARE them. Don't let it be a secret. I am a deaf/hard of hearing teacher in Minnesota. I'm stunned that they would take Scarlett out of her familiar environment to do observations on her. I cannot fathom how they will get accurate observations if she's in an environment where adults cannot communicate with her in her primary mode of communication. It just doesn't make any sense. Don't feel shy about insisting that an interpreter is present, or better yet, that the observations are done in her least restrictive environment (a.k.a. one in which she has access to adults who can communicate with her!). Call a parent advocacy group if you have to. I think in that group is called CASE in the San Fran area. Their number is 415-431-2285. Talk to them and make sure that what the assessment team is suggesting is legal and in Scarlett's best interest. I know you don't want this to be a fight, but Scarlett deserves only the very best!! Hope this helps! I agree, Karen. Right now, they feel then can effectively communicate with the signing they currently use with other students. We will see what happens when she is there. Thanks for the information.